Adjusting the rear shock on the R1200c isn't hard but can cause a bit of confusion. This is the way I do it, I hope it helps you out. First thing I do is get out the tool kit (under the left side chrome panel). Proceed to remove the tool roll from it's protective bag and unroll it. There are three parts to the shock adjustment tool, the hook wrench, the flat extension and the round extension. I'll fit all the pieces together and lay the assembled tool on the ground close to the rear shock. While the bike is sitting on it's side stand, bend over and look at the side of the shock. I'll note what number lines up with the shock adjustment indicator. The adjustment ring has little square windows in which you can look through to see the adjustment indicator on the shock body. Looking through the square hole on the adjustment ring, the adjustment indicator is seen. As you can see, my shock is set on 7, or the highest adjustment. The only thing that can be adjusted on the rear shock is the spring preload. Wheather you want to go up or down, there are seven adjustment stops (one being the lightest and seven being the heaviest). When your bike is delivered new, it will most likely be set on number three. If you find the ride too stout, go to a smaller number. If you find the ride too soft, or you feel your shock bottoms out on bumps, go to a higher number. 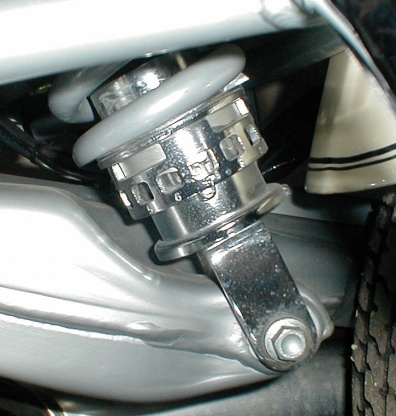 Where the shock should be adjusted is as soft as possible without bottoming out under normal use. To adjust the rear shock spring preload, make sure the shock is as unloaded as possible (this means don't try to adjust the shock with someone sitting on the bike). With the bike sitting on the sidestand, I'll even pull the bike more onto the sidestand (like you are trying to lift the rear wheel) while trying to rotate the adjustment ring. Turning the adjustment ring is just a matter of hooking the wrench into the ring and turning it the direction you are in need of. All the wrench pieces assembled and ready to adjust. Please note I've removed the passenger peg, this was for clarity only. 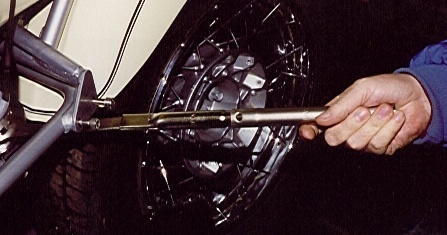 The shock can be adjusted with the peg in place.